Di Morelli Hydrating Face Mask with Hyaluronic Acid helps to reduce the appearance of signs of aging, the overall result is a brighter, more radiant complexion. 1. Cleanse skin and pat dry with clean towel. 2. Gently remove sheet mask from sachet and unfold. Place mask on face, adjust to fit around eyes and nose area first. 3. Allow the mask to sit on the skin for 15-20 minutes then remove the sheet. 4. 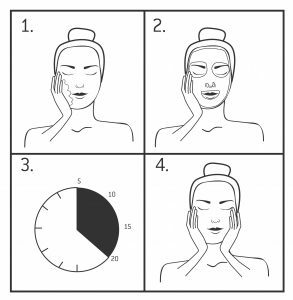 Massage excess product into skin. Moisture binding ingredient, keeps skin plump, hydrated and healthy. Builds collagen and repairs skin. Water, Glycereth-26, Glycerin, Butylene Glycol, Dipropylene Glycol, Niacinamide, PEG/PPG-17/6 Copolymer, 1,2- Hexanediol, Pinus Sylvestris Leaf Extract, Chrysanthemum Morifolium Flower Extract, Citrus Medica Limonum (Lemon) Fruit Extract,Brassica Oleracea Italica (Broccoli) Extract, Hippophae Rhamnoides Fruit Extract, Prunus Armeniaca (Apricot) Fruit Extract, Morus Alba Bark Extract, Thuja Occidentalis Leaf Extract, Vitex Trifolia Fruit Extract, Oryza Sativa (Rice) Bran Extract, Urtica Dioica (Nettle) Extract, Persea Gratissima (Avocado) Fruit Extract, Euterpe Oleracea Fruit Extract, Sambucus Nigra Fruit Extract, Vitis Vinifera (Grape) Seed Extract, Juglans Regia (Walnut) Seed Extract, Simmondsia Chinensis (Jojoba) Seed Extract, Rosa Centifolia Flower Water, Glycine, Glutamic Acid, Dipotassium Glycyrrhizate, Lysine, Leucine, Maltodextrin, Methionine, Valine, Betaine, Bis-PEG-18 Methyl Ether Dimethyl Silane, Serine, Sodium Starch Octenylsuccinate, Sodium Ascorbyl Phosphate, Sodium Hyaluronate, Cysteine, Silica, Aspartic Acid, Alanine, Arginine, Isoleucine, Carbomer, Calcium Pantothenate, Tyrosine, Tocopheryl Acetate, Threonine, Panthenol, Phenylalanine, Propylene Glycol, Proline, Pyridoxine HCI, PEG-40 Hydrogenated Castor Oil, Hydroxyethylcellulose, Histidine, Allantoin, Disodium EDTA, Ethylhexylglycerin, Phenoxyethanol, Fragrance. We created Di Morelli HA Masque to boost the results acquired from consistent use of the Di Morelli regimen. 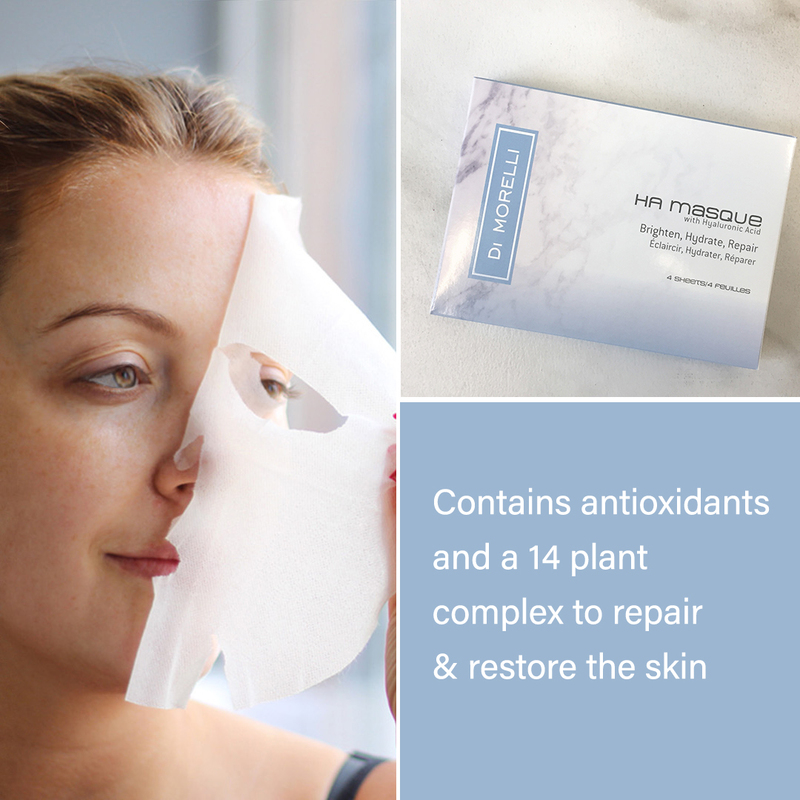 This easy to use sheet masque promotes a hydrated, healthy complexion while working to give the skin a radiant glow. It contains a blend of natural and science based ingredients that are compatible with all skin types.